The Green Bay Packers, founded by Earl (Curly) Lambeau and George Calhoun, joined the American Professional Football Association (later the NFL) in 1921. One of the NFL’s most successful franchises, the Packers have won thirteen national championships, more than any other team in NFL history, and four Super Bowls (following the 1966, 1967, 1996, and 2010 seasons). The Packers have twenty-two Pro Football Hall of Famers, including Curly Lambeau, Vince Lombardi, Bart Starr, Ray Nitschke, Willie Davis, and Reggie White. From 1933 through 1994, the Packers played three or four regular-season games in Milwaukee each season. 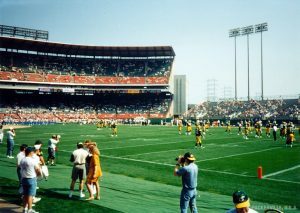 The Packers also hosted one playoff game at Milwaukee County Stadium, the Western Conference Championship against the Los Angeles Rams on December 23, 1967. ^ “Chronology of Professional Football,” NFL.com, last accessed May 24, 2013. ^ “Hall of Famers,” Packers.com, last accessed May 24, 2013. ^ “Borchert Field: Home of the Packers,” April 25, 2009, Borchert Field.com, The Online Museum of the American Association Milwaukee Brewers, 1902-1952, last accessed May 24, 2013. ^ “The Packers-Rams Series,” Packers-Rams Week 7 Dope Sheet, Packers.com, last accessed May 24, 2013. Gulbrandsen, Don. Green Bay Packers: The Complete Illustrated History. 3rd ed. Minneapolis: MVP Books, 2011. Names, Larry. The History of the Green Bay Packers. 4 vols. Wauwatoma, WI: Angel Press, 1987-1995. Povletich, William. Green Bay Packers: Trials, Triumphs, and Tradition. Madison: Wisconsin Historical Society Press, 2012.